1. Know the APICS Dictionary. Knowing this terminology when reading each test questions will be essential to understanding the questions and getting the question correct! If you are an APICS member you can get a free copy of the dictionary. 2. Make sure to study important APICS books like “Introduction to Materials Management” by Arnold and the APICS OMBOC. These books are listed as important references in the Certified in Production and Inventory Management exam content manual. 3. Map out your study schedule– simply walking into a Certified in Production and Inventory Management exam thinking you will pass is almost certain failure. Dedicate an hour each day to study and prepare for your next test. 4. Get plenty of sleep the night before the test. If you party all night before your test you will not be 100% prepared walking into the test. Arrive early so you are not rushing to get into the test. 5. Have some life experience in Production and Inventory Management before taking the test. Life experience is something you can not get from a book. Working in a production/ inventory environment will give you the experience necessary to pass the exams. 6. Use a CPIM exam simulation software like professional test pro’s CPIM simulation software so you can practice in a simulated environment before you go and take the real test. 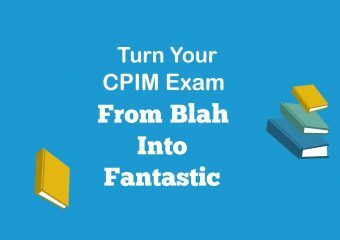 Answering CPIM questions similar to the actual exam will give you the peace of mind that you will be able to pass the test. Don’t take the test until you score above 78% on the simulation CPIM tests. You only need ~70% to pass each test, but you will want some extra padding before actually walking into the real test for the first time. 7. Read and re-read the CPIM exam content manual. This will give you the content for the exam along with some sample questions. This small booklet will be the core subject areas that each test will cover. Knowing these subject areas can focus your studying so you can pass the next test you are preparing for. 8. Use time management in your test. Don’t spend an hour trying to solve one question forcing you to rush through the last 10 questions. Mark any question you are having troubles with and come back to it later if you have time. Your test simulation software can help you practice this time management. 9. Read the questions carefully. Some qualifying words APICS use are most, least, except, or not. These are important words in order for you can answer the questions properly. Following these 10 simple Certified in Production and Inventory Management tips will put you in a good position to pass your CPIM exams the first time. Job Test Prep is built on teachers, technology developers, and certified analysts to help combine learning objectives, latest technology, and detailed questions to help you pass the Certified in Production and Inventory Management Exams the first time.